Where one door closes, another opens. 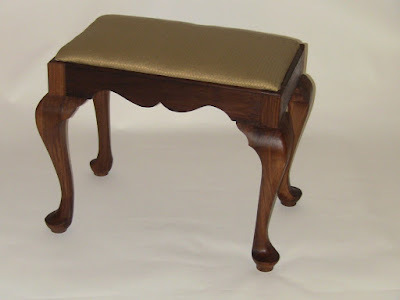 My Queen Anne foot stool wasn't selected for the SAPFM exhibition at the Connecticut Historical Society. I knew I was up against some tough competition for limited space. SAPFM includes some of the finest period furniture makers in the country, so I was just happy to be able to throw my hat in the ring, and it pushed me to expand my skills. Out of over 90 pieces submitted, 34 were chosen. However, the foot stool was selected for the WoodExpo 2012, part of the New England Home Show at the Seaport World Trade Center in Boston, MA, February 23-26. This is an exhibition of custom crafted furniture organized by Tommy MacDonald, aka Tommy Mac of the PBS woodworking show Rough Cut, and Neil Lamens of Furnitology Productions. Thanks for the opportunity, guys! Had I not been spurred on by the SAPFM exhibition, I wouldn't have had something to submit for the WoodExpo. The Expo also features presentations by guest speakers such as Allan Breed and Freddy Roman, among others. Al is truly a world-class craftsman, winner of the SAPFM 2012 Cartouche Award; I've had the privilege of taking several classes from him. Freddy is the coordinator for the SAPFM New England chapter, and specializes in inlay banding and Federal style. One of the requirements for craftsmen accepted for exhibition at the Expo is to be present and bring an educational/teaching tool to aid in educating the public about custom furniture fabrication. So if you're at the Home Show, stop by and say hello! Looking at the photos from past Expos, you can expect to see a range of furniture, from my modest little foot stool to spectacular large inlaid Federal pieces. Congratulations, Steve. Its a beautiful piece no matter who selects it for whatever showing.